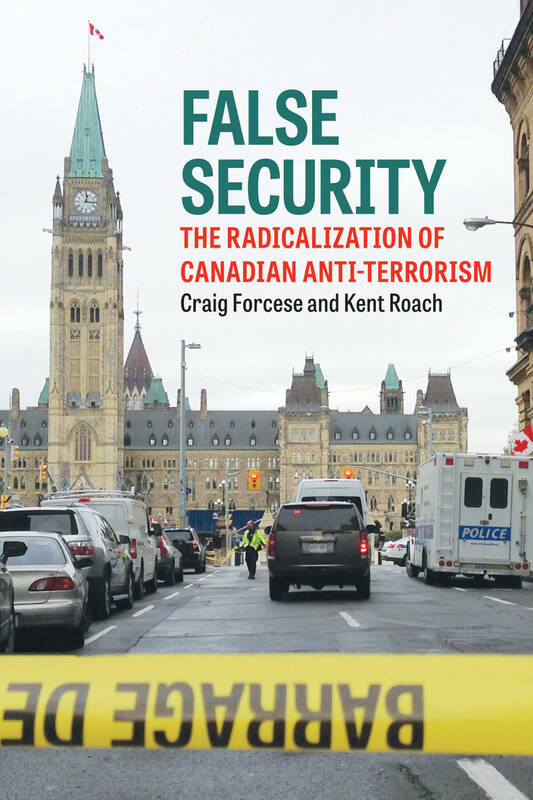 What follows is adapted from material contained in False Security: The Radicalization Of Canadian Anti-terrorism, by Craig Forcese and Kent Roach. Bill C-51 follows in the footsteps of that regulation by creating a new offence for knowingly advocating “terrorism offences in general,” while being at minimum reckless that someone may commit an act of terrorism as a result. Like the War Measures Act offence, this new speech crime is punishable by up to five years imprisonment. A big difference, however, is that the Bill C-51 offence is designed to be permanent, whereas the War Measures Act lapsed with the emergency. Bill C-51 also creates a new concept of “terrorist propaganda” defined as “any writing, sign, visible representation or audio recording that advocates or promotes the commission of terrorism offences in general . . . or counsels the commission of a terrorism offence.” The government may now seek judicial orders to seize “terrorist propaganda” and delete it from the Internet; customs officials can seize it at the border. Oh, people of Canada, you are said to be an educated people. So what is preventing you from being able to put two and two together and understanding that operations such as that of brother Ahmed Rouleau of Montreal and the storming of Parliament Hill in Ottawa are carried out in direct response to your participation in the coalition of nations waging war against the Muslim people? . . . You have absolutely no right to live in a state of safety and security when your country is carrying out atrocities on our people. . . . Your people will be indiscriminately targeted as you indiscriminately target our people. I warn you of punishment in this worldly life at the hands of the mujahideen, and I would also like to warn you of a greater punishment, and that is the eternal punishment of hellfire promised for those who die not having submitted as Muslims to the one true god of all that exists. Would Maguire be guilty under the new offence? He had long since crossed the line between non-criminal and criminal conduct. His journey to join ISIS, his participation with them (including in making the video), and perhaps his instructions in the video to commit violence were already terrorist offences prior to Bill C-51. But nuance is required in parsing the speech itself. Maguire’s first lines may amount to the crime of uttering threats, but they also seem to be an attempt to interpret and justify the October 2014 terrorist attacks—whereas the second Maguire quotation above crosses several criminal lines, including under pre–Bill C-51 law. Maguire argues that good Muslims should either join ISIS overseas or do something bad with a knife or explosives in Canada. If saying all this was a crime already, would it also be a crime under the new speech offence? To convict Maguire for the second set of statements under the Bill C-51 speech crime, the prosecutor would have to prove only that he knowingly promoted “terrorism offences in general” while being aware, at minimum, of a risk that someone (regardless of his or her mental state) might commit an offence as a result. There would be no defence of commenting on matters of political and religious opinion—even though Maguire’s video contained much (albeit misguided) political and religious commentary. Moreover, someone who re-posts Maguire’s videos or publishes his statements could be charged for aiding the offence. (The Crown would have to prove that the re-publisher intended to assist Maguire in accomplishing his objectives.) The government could also seek a court order obliging those who have posted Maguire’s video to remove it from the Internet or allowing the government to seize hard copies (or other media) containing the statements. Here, the intent of the poster would likely be irrelevant: material that fits the definition of terrorist propaganda can be seized or deleted no matter why a person may be reproducing the message. Of course, we have no sympathy for the content of Maguire’s message. But criminal law is a blunt instrument for responding to bad ideas, and it is one guaranteed to attract scrutiny under the Charter of Rights and Freedoms. The state’s fight against terrorism is a battle against violence and not against ideas—even extreme ones. In the 1970s, it was a tactical mistake for the state to charge the radical intellectual Pierre Vallières, sometimes called Quebec’s Malcolm X, with counselling crimes though his incendiary and controversial pro-FLQ tracts, including his book Nègres Blanc d’America. Vallières welcomed the prosecutions and wrote that it was “very important for the FLQ and for the Québec revolution to have driven the Crown and the Court to politicize my trial themselves . . . by placing my writings, ideas, political activities at the center of the debates.” It’s likely that the new speech offence will engender the same kinds of political trials. By making a recruitment video for a terrorist organization, Maguire became subject to a penalty much stricter than the five years’ imprisonment available under the new speech crime. If a trial were to be held under existing terrorism laws, the content of the video would be almost incidental. All that would matter is that Maguire made the video “for the purpose of enhancing the ability of [a] terrorist group to facilitate or carry out a terrorist activity.” And he surely had that purpose. Put another way, our traditional terrorist crimes are either content-neutral when it comes to speech or tied to content that is much more proximate to actual terrorist violence (such as counselling or inciting murder) than is the new speech crime. And, indeed, the more content-neutral approach was followed in January 2015 when Maguire (who many believe was killed in Syria) was charged in absentia not for his video per se but for facilitating terrorist activity for ISIS. Such charges put the emphasis where it should be: on violence, not on the ideas and grievances that motivate it. Maguire’s charges belie the claim made by government that existing laws were inadequate. The government will argue, with some justification, that analogies to the FLQ and Pierre Vallières are quaint and out of date. Much of ISIS’s success in recruiting people from Canada and elsewhere has been attributed to its use of social media and slickly edited videos that ISIS and its supporters make available on Twitter, YouTube, Facebook, and other social media. This has made terrorist propaganda more readily available and censorship more difficult. Private Internet companies have co-operated but have not always embraced a policing role. At any rate, the cancellation of Twitter and other accounts has resulted in other forms of social media being used. The whack-a-mole effort to limit Internet propaganda may be worthwhile if it stalls the dissemination of terrorist messages. But that is quite different from the issue of having trials and locking up people who say the wrong things. In other words, Should propaganda be censored? and Should people be jailed for expressing extreme views? are discrete questions. They do not require identical answers. As discussed below, terrorist propaganda—properly defined—should be displaced from the Internet to the extent possible. But Bill C-51 manages to be both over-inclusive and under-inclusive in not reaching the full range of terrorist propaganda. Its careless sweep is such that it can reach speech (and therefore justify censorship under the new propaganda deletion and seizure rules) that may simply express extreme ideas. But, at the same time, it also falls short and fails to censor speech such as how-to manuals about bomb building. The government may have intended the new speech offence to be its main instrument in a “hearts and minds” approach designed to counter ISIS. But it is far from clear that it (and the related propaganda concept) would apply to all of the group’s propaganda, some of which is more nuanced than grisly beheadings. Take a recruitment video featuring Canadian Andre Poulin, released in mid-2014. In it, Poulin promises recruits the following: “You’d be very well taken care of here. Your families would live here in safety, just like how it is back home. You know we have expanses of territory here in Syria.” Another video by a British recruit stated, “Living in the West—I know how you feel—your heart feels depressed. The cure for depression is jihad.” Like Maguire, Poulin was already a criminal under the original 2001 anti-terror laws simply because of participating in ISIS activities, including the making of this video. But the video itself does not appear to fit the definition of terrorist propaganda or to offend the content rules in the new speech crime, as best as anyone can understand them. It’s a rare and welcome constraint in Bill C-51’s speech rules. Banning speech that is not closely tied with violence is not part of our democratic tradition. A free and democratic society does not allow threats of violence, but it has faith that people will reject ideas that condone or even encourage it. And both past experience and contemporary technology indicate that speech cannot be banned without creating knock-on effects more detrimental than any benefits achieved. The new speech crime in Bill C-51 does not reach quite as far as a United Kingdom–style glorification-of-terrorism offence. It seems instead to draw inspiration from an Australian “advocacy” offence enacted in 2014. Borrowing is common when laws are hastily drafted, but it raises the question of whether the new regulation is appropriate for Canada or consistent with the demands of the Charter. In 2007, the House of Commons committee reviewing the 2001 Anti-terrorism Act proposed that Canada follow the United Kingdom’s lead and enact a glorification offence. Members of the NDP and the Bloc Québécois dissented on the basis that it would infringe freedom of expression. The Conservatives and Liberals, meanwhile, called for a new incitement offence. The Conservative government’s demand for a new speech crime ignored the ability of existing criminal laws to cover much threatening speech. It was already illegal to counsel the commission of any offence. Counselling means to “procure, solicit or incite,” “induce or advocate—and . . . not merely describe—the commission of an offence.” A person who counsels another becomes a party to an offence if the person counselled then commits that offence or another like it. In fact, a person who counsels the commission of a crime is guilty even if the crime never occurs. Counselling can be a terrorist offence, and a person who implores others to commit acts of terrorism (such as leaving Canada to join ISIS) can be convicted for it. Mohamed Hersi was jailed in 2014 for counselling an undercover officer to go to Somalia and join the terrorist group al-Shabaab. More recently, Othman Hamdan was charged in July 2015 with counselling murder and various forms of assault to benefit ISIS, apparently in the form of online activities. And all that applies even before we get to specialized terrorism offences. After 9/11, Parliament enacted a host of crimes that, broadly speaking, doubled down on the counselling concept. The application of these terrorist crimes to speech acts has been underappreciated. the person whom the accused instructs to carry out the terrorist activity knows that it is a terrorist activity. This is an astonishingly broad crime. It is difficult to see how the Commons committee believed in 2007 that our existing law could not reach statements made where no particular individual is “encouraged to emulate any specific actions.” After all, the offence clearly states that it applies both to direct and indirect instruction, and that it does not matter whether the speaker instructs a particular person or whether the speaker knows who will carry out the terrorist activity. All that really matters is that the thing instructed be a terrorist activity. And that is not much of a restraint given the breadth of such activity. As already noted, terrorist activity itself may involve speech acts of threatening or counselling. And so it would be a crime to instruct someone to threaten an act of terrorist violence. Analyzing the speeches of al Qaeda leaders. Calling for support for jihadist groups. Acting as a spokesperson for captured jihadists. Singing the praises of jihadist leaders who died for the cause. Ensuring the security of online communications between jihadists. Taking part in psychological warfare. Providing military training with the purpose of implementing violent jihad. Producing a series of videos called the “Califate Voice Channel,” with the aim of transmitting news from the jihadist front. Acting as an official media outlet for two groups taking part in terrorism. The accused was deeply invested in his cause and was not an idle apologist of things terroristic. This undoubtedly contributed to his conviction for various terrorism offences. The behaviour cited by the court in support of the participation and facilitation convictions ranged from outright threats to speech more distantly linked to violence, including some speech that may simply have amounted to forms of radicalized boasting. Nevertheless, Namouh’s speech acts contributed to his convictions because they were uttered in a manner that involved actual participation with a terrorist group. A conviction such as this demonstrates that even speech removed from actual violence could be penalized before Bill C-51. We have pragmatic and principled objections to the new speech offence that Parliament enacted. It will be difficult for the government to justify the new offence given the amount of speech that is already criminalized by existing offences. But even leaving aside rights-based Charter concerns, we have pragmatic policy-based concerns. Offences directed at the wrong type of speech are simply supply-reduction strategies that will be consumed with whack-a-mole difficulties. There is a need for a demand-reduction strategy: a holistic and evidence-based multi-disciplinary approach toward countering violent extremism. Unfortunately, the new and unnecessary speech offence in Bill C-51 could be a barrier to such a strategy. It is a mistake.